Home > Exterior Car Care > Wolfgang Deep Gloss Liquid Seal 8 oz. Creates a long lasting, incredibly strong layer of UV polymer protection! Wolfgang Deep Gloss Liquid Seal is a must-have product to add to your collection of detailing waxes and sealants. Wolfgang Deep Gloss Liquid Seal is an advanced spray-on, walk away paint sealant that provides Wolfgang’s signature deep gloss shine and durable German Super Polymer paint protection. The durable sealant provided by Wolfgang Deep Gloss Liquid Seal offers maximum UV protection to keep your vehicle’s paint looking great for years. Protects and enhances painted surfaces for months, not weeks! 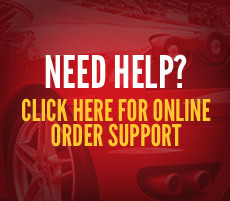 Provides excellent UV protection for headlight lenses. When used on glass water will bead up and roll off! 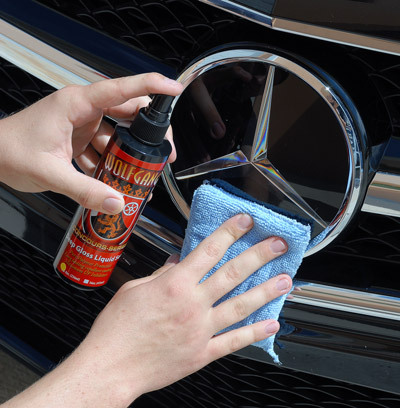 Use it regularly on plastic and metal grilles to make removal of bug splatter effortless! The super slick surface will prevent anything from sticking, except the shine! Wolfgang Deep Gloss Liquid Seal is as easy to use as a spray detailer. To use, simply mist a small amount product onto the paint and spread it out using a clean foam or microfiber applicator pad. After spreading the product out, walk away! 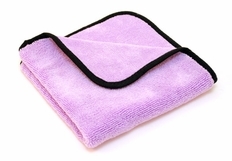 Buffing with a microfiber towel is not required after applying Deep Gloss Liquid Seal. With a product this user-friendly, anyone can get professional grade results. In the tradition of all Wolfgang waxes and paint sealants, Deep Gloss Liquid Seal creates a rich, deep gloss shine on all colors. The slick feeling finish left behind by Wolfgang Deep Gloss Liquid Seal repels air-borne contaminants, allowing you to enjoy your show car finish longer. There are no chemical cleaners, abrasives or harsh solvents used in this formula, so there’s no possibility of dulling or clouding paint. Wolfgang Deep Gloss Liquid Seal will help you achieve unmatched gloss, reflectivity and shine. The German engineered super polymers contained in Wolfgang Deep Gloss Liquid Seal chemically bond to the paint for excellent durability in the harshest environments. Wolfgang Deep Gloss Liquid Seal stands up to repeated washings, rain, snow and other environmental situations. This strong chemical bond ensures your paint is protected through long, hard winters, and punishing hot summers when your paint needs the most protection. Deep Gloss Liquid Seal not only creates a repellent finish that’s slick and glossy, it also provides the maximum level of protection from the harmful UV rays emitted by the sun. It’s a given your car will be exposed to the harmful Ultra Violet spectrum of light that beats down on your car’s delicate clear coat finish. The UV inhibitors found in Deep Gloss Liquid Seal block these harmful rays from damaging your vehicle’s paint. The sun is the biggest enemy to your car’s paint. If you have to park your car outside for any portion of time each day, then you must stop UV damage in its tracks with Wolfgang Deep Gloss Liquid Seal. Wolfgang Deep Gloss Liquid Seal can used to protect more than just your paint! The advanced German polymers in Deep Gloss Liquid Seal will bond to and protect plastic trim, glass, chrome, and wheels! Treated glass will repel water, trim will attack less dust and wheels will repel break dust. What’s more, Deep Gloss Liquid Seal can be used on vehicles protected with a clear bra! Wolfgang Deep Gloss Liquid Seal might be the most versatile product in your detailing arsenal! Wolfgang Deep Gloss Liquid Seal is made using 100% pure protection ingredients. This is the best option for paint already in good to excellent condition, like new cars, truck, sport utility vehicles, motorcycles, and especially high-end RV’s with a clear coat finishes. Because Wolfgang Deep Gloss Liquid Seal is pure protection in a bottle with no cleaning or abrading ability of its own, best results are achieved when used on paint already in good to excellent condition. Before using Wolfgang Deep Gloss Liquid Seal first wash, dry and then inspect your vehicle’s finish for above surface bonded contaminants and if discovered, use Wolfgang Elastic Poly Clay and Wolfgang Clay Lubricant to clay the paint. 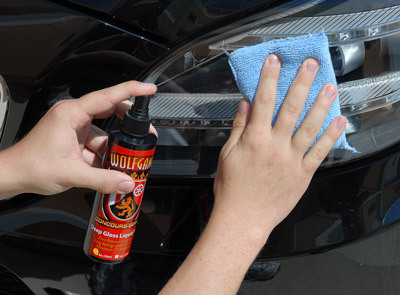 If paint is only lightly oxidized or contaminated, then after claying use Wolfgang Paintwork Polish Enhancer. If below surface defects like swirls, are detected, then pre-polish paint using Wolfgang Total Swirl Remover followed by Wolfgang Finishing Glaze. Before using Wolfgang Deep Gloss Liquid Seal, paint needs to be clean and dry. Work in the shade on a surface that is cool to the touch. If you can’t place your hand on the paint and let your hand remain on the paint comfortably, then the paint is probably too hot. Work on one panel at a time. A panel equals a hood or a fender, or a door, etc. A larger panel like a hood should be treated as two panels. Mist product over a section of paint. Spread sealant over surface using a clean, dry foam or microfiber applicator pad. One spray per panel is all that’s needed. If there is any excess product on the panel after spreading it out, you are applying it too thick. Lighty buff off excess with a microfiber towel. Repeat until entire panel is covered. Move onto a new panel until entire vehicle is coated. Additional coats can be applied one hour apart. Maintain you new Wolfgang Deep Gloss Liquid Seal finish using Wolfgang’s Auto Bathe and Instant Detail Spritz.